Please come and join the discussion in the Let's talk ... thread. If you are interested in a free 21 day guided meditation, Oprah and Deepak Chopra have one beginning on Monday, June 11. My name is Julee. I took over the leadership of this team because I wanted a place to learn and discuss Ayurveda. I am not an expert. I am working my way through several books at the moment and an introductory class online. I have several. But at the moment I am working my way through Cate Stillman's Body Thrive. It is about taking Ayurvedic practices and making them habits. 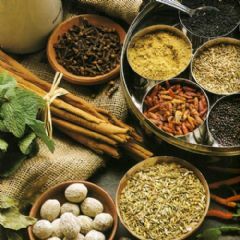 It is a process to incorporate Ayurvedic practices into a modern life. Cate Stillman is trying to make it accessible for us. I want to reorganize this team page but I want to do it in a thoughtful way so I haven't made any changes yet. Is there anything you would like to see or find useful? Very new to Ayurveda and restarting my yoga practice which I did in my teens but now in my 50s I am trying to keep to a daily practice once more. I know I need to do this for my health, my focus is no longer on losing weight, in fact, I care little for that. If it happens it does but what I care about is not getting heartburn every single day and having to take zantac and tums every day. I know this is a quiet team but I am still hoping to find suggestions here. Hi everyone! New here and just wanting to pop in and say hi! Life's so uncertain, eat dessert first! So for the 4th of July, I went with a vegan Boca patty instead of the 1/3 pound hamburgers that the rest of the family was having. I enjoyed it more than I would have enjoyed the beef, and it kept me well within my fat, cholesterol, and calorie targets for the day. I am undergoing numerous tests, doctor visits, etc. in Little Rock, AR...keeps me busy, overwhelmed, and exhausted. Concurrently, my DD Katie, in Phoenix, is undergoing treatment for near loss of vision in her right eye...the specialist says that it is an auto-immune disease, no cure-just treat the symptoms and often signals the onset of MS/Multiple Sclerosis. I have been just devastated and worried as only a mother who has been an RN most of her life, can be--a lot--I know the worst, but am trying to focus on the positive. I have given her advice on quieting her immune system and changing her diet to a clean and alkaline diet. I am currently reading two Ayurvedic lifestyle books by Yogi Cameron Alborzian; known as the "Model Guru". The books are: "The Guru in You" and "One Plan"; he also has some great iPhone apps that complement his plan. The One Plan book has an overview, all in plain English that can easily be understood; and, then a 52 week "Plan" to change your lifestyle and become healthy-mind, body, spirit. I love it! I have not started his plan week 1 yet; but, I have been implementing some changes: no more diet or regular soda ( have had maybe 3 since Feb 24), no meat (none since Feb 24)...I may eat some fish/seafood as it goes along; but, haven't yet. I have been using Ayurvedic supplements for some time--will explain more later on these. I am using Ghee or clarified butter daily. I am participating in the Chopra Center 21 Day Meditation Challenge on "Perfect Health"--free and as always high quality and a blessing. Additionally, I am working on my Reiki III-Master/Teacher certification. Did I mention that I am exhausted? My fibromyalgia is escalating, a sleep study did not show any sleep apnea; but did show a constant drop in my oxygen to around 82% when I do sleep--exploring possible causes-heart vs. respiratory...I have been given oxygen to wear at night. Another blow, my new PCP tells me I should NOT be driving a car--I completely dissolved in her office at this point. With holidays and stress, I had gained back 14lb (low of 183 back to 197; started here in 2011 at 216); now, back down to 188 as of today! I added a new link to our collection today. and saw that they're offering a free eBook on loving your body type. It's some of the same info you'll find in her other books but there is some good dosha-specific info, and of course, my favourite, the daily schedules. I've been getting up before the sun because I'm doing overtime at work. Ayurveda suggests waking before the sun (or before 6 a.m. depending on which source you reference) because after 6 a.m. it's a kapha period and it can make you feel sluggish and groggy all day. I can say for myself that I know this to be true. Here is a link to a short article about the benefits of the Ayuredic daily schedule. Other links can be found on the LINKS section of our page (it's over there under the huddle button). Make it a brilliant day, friends! It has a lot of good information on herbs and treatments of particular ailments. I think it's a good resource but not necessarily a read it cover-to-cover kind of book. In doing a little investigation into finding an Ayurvedic practitioner in my area, I just learned about a seminar at the local Sivananda center called The Dharma of Food. It's this Saturday. Usually I have to work Saturdays but I just happened to get this one off. So I'm thinking of going! "In the last 200 years or so we have weakened our ties to the earth. It is the earth that manifests our food. It is indeed time we return our thanks to the elements that it is made of: space, air, fire, water and earth itself. We do this by remembering that food begins with taste, carries energy and eventually turns into the five elements within. In this lecture we will discuss the Ayurvedic and Yogic concepts of ahara: that which nourishes us and pathya: a suitable diet based on individual need. In the end, food must nourish us emotionally, mentally and physically. We must change our language from "nutritional value" to "taste and nourishment value" to once again discover the joy of eating dharmically." Thanks for thinking of me and my tooth. Trying to look at it in a positive light, it's making it difficult to eat (I can't open my jaw wide) and helping me to eat more mindfully since I can only eat a tiny bite at a time. I received my copy of Eat/Taste/Heal. It's a beautiful hardcover book. I was expecting a paperback! I'm looking forward to starting to read it this evening. I hope everyone's having a delightful, light-filled day. T - I am sorry to hear about your tooth. Good luck with the oral surgeon. I own the book, Eat Taste Heal. I will happily work through it with you. I just started reading Ayurveda; A Comprehensive Guide to Traditional Indian Medicine for the West by Frank John Ninivaggi, MD. It is more like a textbook than Eat, Taste, Heal, for that reason it will take me awhile to get through. I love Amazon Prime, too. Pam - I have a few of the same issues with establishing an Ayurvedic routine . It is huge and there is a lot to learn. I have some health issues to deal with so I understand about limited stamina. Because of our son's allergies and my own autoimmune issues we are corn, soy and gluten free. Out of necessity, I do most of the cooking which includes baking bread etc because most processed food contains one of the three. So I am not sure how to add Ayurveda into our meals/lives. Just checking in this morning. It's my day off from work and I'm nursing a toothache (I have an appt on Wednesday to see the oral surgeon about having the wicked wisdom tooth taken out). I have plenty of chores to do but will take it easy in between. Later I'll head over to visit my parents. Pam, it's wonderful that you work so hard to take care of your mother. I know it can be difficult for you but practicing compassion like that can only be a positive. I ordered Eat-Taste-Heal from Amazon. Hopefully it'll arrive Monday or Tuesday (I love Amazon Prime!) I'm anxious to see the "modern" recipes. Who else has this book? Would you like to work through it together? Good morning all! It's a beautiful, sunny day here in south central Arkansas--I hope it is the same for each of you wherever you may be! Yesterday, Groundhog Day and Blessed Imbolc, was quite a busy one for me...My son Jeremey, his new wife, Tilda, and 4 of their children came over for the day in late celebration of my birthday (was 1/29). The moved to Hot Springs from New Mexico a couple of months ago; it is so nice to have them close enough to visit whenever we want (~70 miles +/- one way)! Of course, I was on my feet all day cooking, visiting, etc. and by nightfall it kicked my ample behind. I knew what would happen; have had fibromyalgia and other issues long enough to know if I do much at all, I will suffer greatly--some days it is worth the pain and fatigue! Between her appointments I have had one with my Rheumatologist and one with a sleep specialist (avg ~2.5 hours a night in little short 'cat naps'). I will be going to Little Rock for a sleep study in a couple of weeks; I am a little anxious about it. Thank you for the links, T! I am very familiar with all those resources and they are great! I have long wanted to get into a routine that incorporated aspects of the Ayurveda Lifestyle...a couple of roadblocks that I always run into are 1) It is huge and I get overwhelmed knowing I have very little energy, lots of pain, and limited income. I need to (and have to a small degree) pick some doable things, incorporate them, and slowly get it done. Unfortunately, I have always been a bit (or a lot) of a perfectionist and want to get it all done, perfectly, now! I bet others here are the same and having a Challenge to add a few beginning steps would be helpful. I have wanted to add some Challenges/Goals for the Team for some time--this would be a great start! I added a link to an example daily routine by Dr. Vasant Lad to our links page. Would anyone be interested in doing a series of challenges to add elements of the Ayurvedic daily routine to our own days? I'm Kapha dosha and it's recommended that I awaken each morning between 4:30 a.m. and 5:30 a.m. (depending on the source). I've been trying to do this but it's SO TOUGH! Hello! I added two links to dosha quizzes on the Links page of our team. I hope they are helpful. I am interested in incorporating ayurveda into my life. I have read some books but I guess I am looking for advice on where to start. Ayurveda is new to me but I think it would be very helpful with my health issues. Small changes a few at a time seems to be the way I do best at making them stick. I also am having trouble figuring out my dosha. I am told it is rare to have a three dosha type but that is what I keep coming up with. Do I address all three or start with what I feel are out of balance? Do you have any favorite books for a beginner. I have read "Perfect Health" by Deepak Chopra and I own "Eat. Taste. Heal" by Thomas Yarema and others. Good morning! Hope that you all are having a terrific Tuesday! Good Morning and Bright Blessings to you all! I haven't been online much over the past 6 weeks or so; and, I must apologize. On a positive note, I have had some wonderful things keeping me busy! We became surrogate parents to a couple of abandoned, 3 wk old kittens the first of May; I spent 8 days in Phoenix in mid-May for my DD's graduation from college--also was able to visit my youngest DD and her family who live there as well and my DS came over from NM with his GF to visit (he was graduating the same day that Katie did! ); I was wiped out upon my return home (way more activity than usual and w/ my health issues I pay later-worth it though); my Mother has had several household issues going on causing her great anxiety and I have visited a couple of times...; one of my favorite great aunts passed on unexpectedly in late May and we went down for her funeral...before I could "catch my breath", Katie (DD) informed me that she and her new boyfriend were coming to visit! I was ecstatic to have her visit and totally stressed to have her boyfriend come here (my issues with the house we rent, not as clean as I want, end of the month and out of money, etc...). DH and I embarked on a MAJOR cleaning, de-cluttering, re-arranging, yardwork, etc. (He even painted some of the ceilings that had mildew spots since before we rented the house; landlord is NOT inclined to make any repairs or 'fix-ups...) The house was cleaner and looked better than it has since we moved in by the time they arrived! I was exhausted and had greatly increased pain, and swelling in my feet and hands; but, had to keep pushing. They arrived on Tues. 6/26 and stayed until Tues. 7/3...we did a lot of visiting, sight-seeing around this part of the state, cooking and eating out (but I lost weight, YAY! ), and in general had a great time! When they left, I cried all evening--I missed them already, was beyond exhausted, and in so much pain that I could barely walk. I used to be a super multi-tasker; I have lost that ability as my health has deteriorated and my life has changed so drastically. I did try to at least log on on and spin the wheel just to be 'present'; but, I did not have the energy or time left over to post--I was just overwhelmed mentally and physically. I have truly missed being here and look forward to being more active and putting SparkPeople, my teams, and my fantastic friends here back up at the top of my priority list--along with 'me time'! Ok. I hope you find the results that feel right for you. This team is a quiet one. It is interesting, isn't it? A busy time for you. How wonderful that your children are doing so very well. I am not "in the best place" right now, but onward I go. I am not one to give up. I look forward to checking in here more often..
Good morning, Team! I am starting this thread just for everyone to stop in and tell us how your day is going, share triumphs and trials, anything you want to share! Happy Beltane! Dance today as if no one is watching--even if you don't have a Maypole! As I mentioned yesterday, I have been languishing in my long, dark tunnel...pain, depression, anxiety, major fatigue (see SP Page)...I see a spot of light now and hope I emerge into the light very soon! Not meant to be an excuse, no pity wanted...just where I've been/am--I do not understand the sudden ramp-up of the depression and anxiety; I have had several good things happen recently...SIGH. I am not going to try to 'catch-up'; just jumping back in here now! I hope to see you all here! OK, enough about me! I hope each of you have a magical, happy day!